Description: Collection of Tablets to individuals – addressed mostly to members of the Afnán family in various cities, mainly Shiráz; most of the Tablets are addressed to Áqá Mírzá Áqá Núru’d-Dín. Most Tablets have a note in the margin of each Tablet identifying the handwriting of the original Tablet. All of the Tablets are dated (1290-1308 AH/1873-1891 AD). 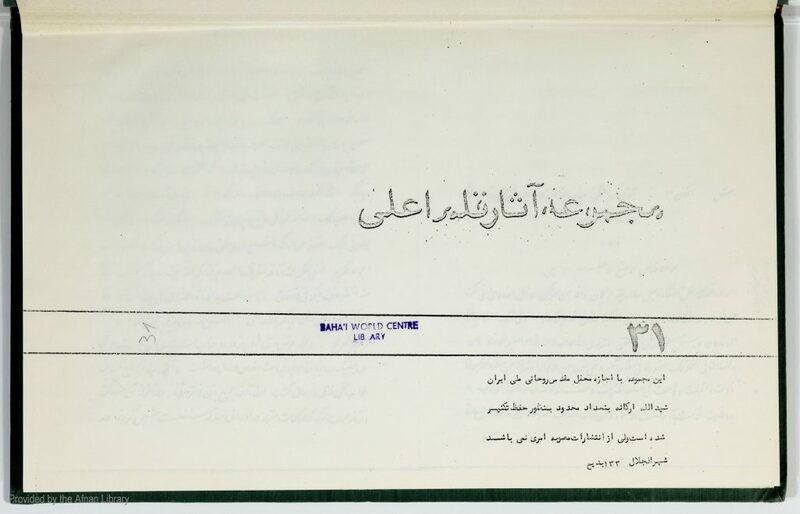 Includes the Tablet of Visitation for the wife of the Báb (p. 76). Manuscript, 218 pp. (113 pp. of PDF).